Habit: Annual from taproot or perennial herb from rhizome; hairs branched or not, glandular or not. Leaf: +- opposite or not, entire to pinnate-lobed. Inflorescence: flowers 1--few per axil, pedicelled. Flower: generally nodding; calyx 5-lobed, enlarged and persistent, bladder-like in fruit; corolla +- rotate to shallowly bell-shaped, generally +- yellow, often dark-spotted adaxially; stamens 5, attached to hairy band in tube, anthers free, generally < filaments, opening by slits; style generally straight. Fruit: berry, fleshy [dry]. Seed: many, 2--2.5 mm, +- spheric to reniform. Species In Genus: +- 85 species: America, Eurasia, Africa, Australia. Etymology: (Greek: bladder, from calyx in fruit) Toxicity: Unripe fruit often TOXIC. Needs study in western United States. Note: Some species cultivated for edible or ornamental fruit. Habit: Perennial herb, subshrub, < 8 dm; hairs simple, dense, short, generally glandular. Stem: often zigzagged, ridged. Leaf: 1--3 cm, generally ovate, fleshy, entire or +- wavy; petiole +- = blade. Inflorescence: pedicel 15--30 mm, in fruit > calyx. Flower: calyx 4--7 mm, in fruit 20--25 mm, weak-angled; corolla 15--20 mm diam, widely bell-shaped, yellow; anthers 2--3 mm, yellow. 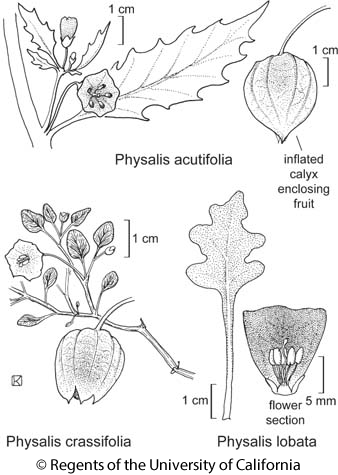 Citation for this treatment: Michael H. Nee 2012, Physalis crassifolia, in Jepson Flora Project (eds.) Jepson eFlora, http://ucjeps.berkeley.edu/eflora/eflora_display.php?tid=38054, accessed on April 24, 2019. PR, s SNE, D; Markers link to CCH specimen records. Yellow markers indicate records that may provide evidence for eFlora range revision or may have georeferencing or identification issues. Purple markers indicate specimens collected from a garden, greenhouse, or other non-wild location.